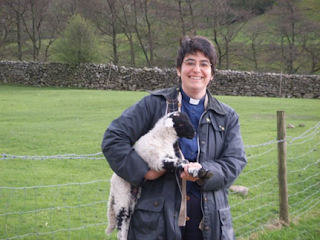 In 2006 I became Vicar of the Parish of Swaledale with Arkengarthdale, in the northern Yorkshire Dales. Not long after I arrived, I was told about one of the problems they had kept for me to sort out – as they do, when you are new. 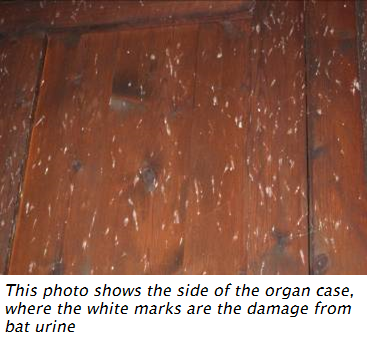 John took a deep breath, and explained that they became a Protected Species after surveys in the 1970s and 80s indicated that their numbers in the UK were rapidly declining. He has continued to be a patient teacher! In 2008 I started a certificate course, Christian Rural and Environmental Studies (www.cres.org.uk), which gave me the opportunity to do some more research about our bats. In my final course project, I looked at both sides of the argument about bats in churches; there are bat conservation issues and there are the problems that can be caused by bats living in buildings that are used as places of Christian worship. 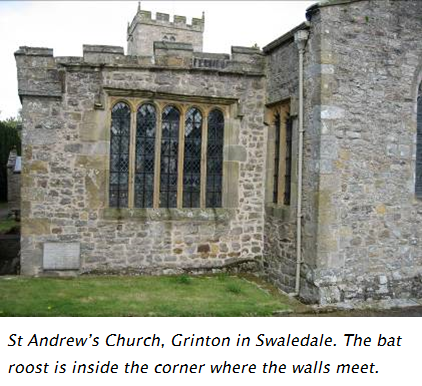 As we couldn’t move our bats on from Grinton Church, the congregation and I decided to learn more about them, to celebrate their uniqueness and to turn them into a feature and a visitor attraction. This had been done successfully at a church in the Lincolnshire fens and we borrowed from their work. This is a three pronged approach which allows people to co-exist with the bats in a positive way. 3. Using the bats for education - we have had a ‘bat day’, aimed at children and families; we have put on talks and guided bat walks and we have some new interpretation boards about bats in the church. I have also done some work with local schools about the bats. This is an ongoing project, in partnership with the Yorkshire Dales National Park, who have supported us with money and practical help, and we aim to continue to raise awareness about the bats and their life cycle. We have also started a monthly bat count with the local bat group in order to determine a pattern for the year. 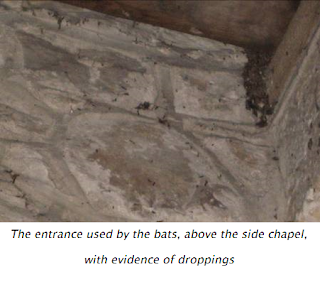 The problems that bats cause in church buildings can be difficult to manage, and need to be handled realistically and carefully, but bats in churches can be approached in positive way; they can be used for educational purposes, for the congregation and with local schools, and they can become an attraction for visitors. Above all, they can be celebrated as a unique feature of a place and as part of God’s gift of creation.